It is likely that the hobby of political collecting had it's origins with the medals issued for George Washington at the time of his first inauguration in 1789. However, the first real presidential campaign, and the first true campaign items, were for the 1824 race between John Quincy Adams and Andrew Jackson. During this campaign and for the remainder of the nineteenth century, medals were issued in support of most presidential candidates. A future article will look at these medals, their history and tips on collecting them, in this article we will look at the campaign button that we are all so familiar with. The 1896 election was a landmark year both in the world of politics and for political collectors. In 1894 the celluloid button was patented and celluloid buttons swept the nation with thousands of types issued. In the 1896 election, politicians adopted the button and made it their own. Republican William McKinley and Democrat William Jennings Bryan had hundreds of different buttons issued for their respective campaigns and these buttons were joined by those manufactured by companies that wished to link their product with a favorite candidate. 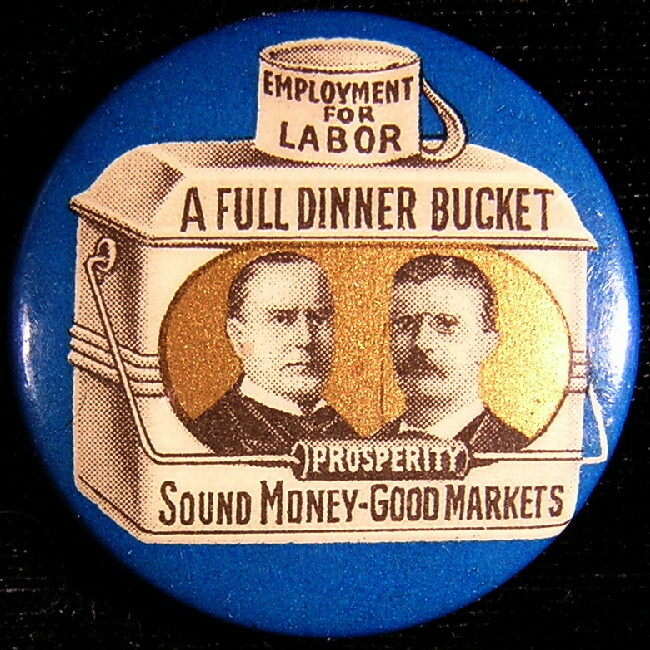 It is not unusual to find a McKinley or Bryan button that is also advertising gum or cigarettes. Celluloid buttons which were used exclusively from 1896 until 1920 and continue in use to this day. 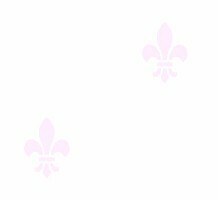 They are manufactured by covering a convex metal shell with a paper which has a photograph or text message printed on it. The paper is then covered with a clear layer of celluloid and held together by a ring called a collet. Often a backpaper and pin were then added to the back of the button. 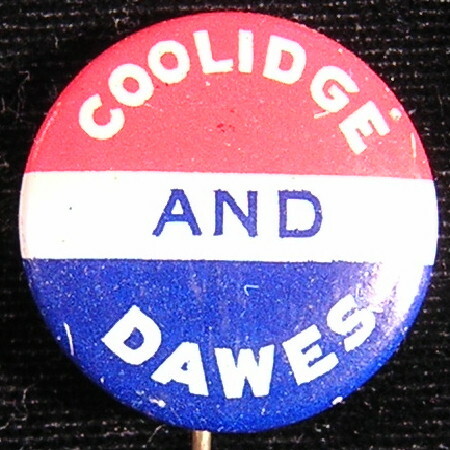 The period of 1896 to about 1916 is considered the "golden age" of political buttons with graphics that have never again been equaled. In 1917 a new process was introduced that involved printing an image directly on a tin shell, eliminating the celluloid, paper and collet. While the Lithographed button could be produced in large quantities with less cost than the celluloid button, lithographed buttons do not allow the same graphic quality. They are most often found with only a candidates name printed on a red, white and blue background. As a result, lithographed buttons are usually less in demand by collectors and command lower prices than similar celluloid specimens. They were first commonly used in the 1920 campaign. Most new political collectors start out as generalists, that is they will collect buttons from both parties and from all periods. An excellent first objective might be to acquire one button from every major party candidate for each campaign from 1896 until today. Imposing certain restrictions will benefit your collection as it forms. Some collectors seek only jugates (buttons with a picture of both the presidential and vive-presidential candidate), a collection that would cost $10,000-20,000+ to complete. Others wish to complete a collection of single picture buttons and will often restrict their purchases to a certain size such as 7/8" or 1 1/4". A collection of this type can be built for as little as $3000, but will cost more if you desire unusual items. Collectors on a more modest budget might wish to limit themselves to text only buttons. In such a collection, most buttons will cost less than $10 with only two or three costing more than $50. Most collectors will eventually discover an area that appeals to them more than others, such collectors are called "specialists." The areas in which a collector can specialize are as limitless as the imagination. A particular candidate may be of interest, I specialize in the buttons of William McKinley. You may wish to concentrate on a third-party such as the Prohibition or Socialist parties. Some collectors collect the buttons of local candidates from their state or city. While not a major problem with a little education, fakes and reproductions do exist. A visit to your local flea market or antique shop will likely confirm this. Most of the buttons encountered are reproductions that were made in the 1960s and 1970s as giveaways by The American Oil Company & Kleenex. These fakes are easy to spot because most will have some sort of inscription on the edge or curl such as "AO-1972" "Repro-1968" "Reproduction" or the candidates name and date (i.e. "Roosevelt-1944"). If you encounter a button that is scratched on the edge, shows evidence of having been painted over on the edge, or is lithographed for a pre 1920 candidate, beware! Most fakes will also look slightly blurry or off-color. Membership in the APIC provides collectors with a wealth of knowledge on all aspects of the hobby, including the latest information on fakes (called brummagem). The "bible" for political collectors is Ted Hake's Encyclopedia of Political Buttons. This three volume set was published in the early thru mid 1970s and has been reprinted. Also available is a 1998 price update which is essential to get the most use out of the Encyclopedia. The three volume set catalogs and illustrates about 12,000 items from 1789 to 1976. While in need of an update, it is by far the best resource available to political collectors. Another book that you may want is Mark Warda's 100 Years of Political Campaign Collectibles. This 208 page book is a superb introduction to the hobby which pictures and gives prices for over 800 items. 2002 WNCCOINS.COM. All rights reserved.